I feel like the supermarkets dragging out the the Christmas decorations half way through the year, but I do have a valid reason. 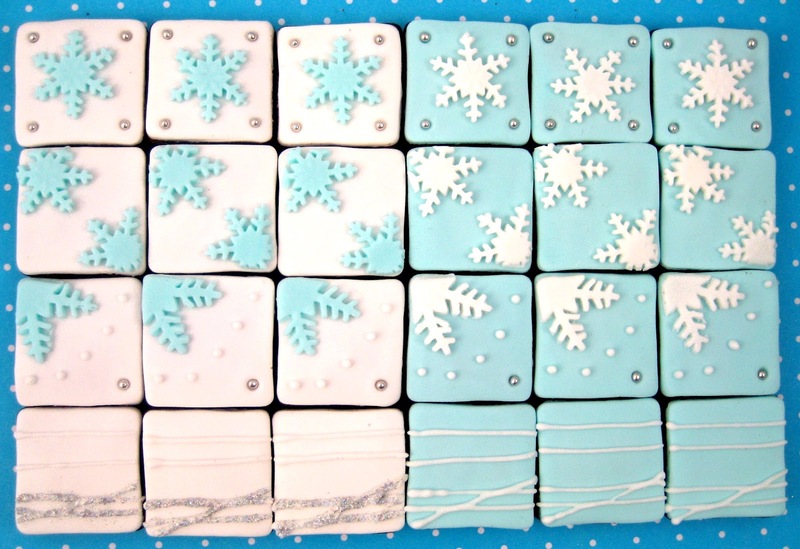 One of my friends is hosting a Christmas in July celebration and asked me to make some of my white snowflake cookies and snowflake cake pops. Anyhoo to cut a long story short I had just spied some super cute square cookies here and here I was really feeling the square cookie love. 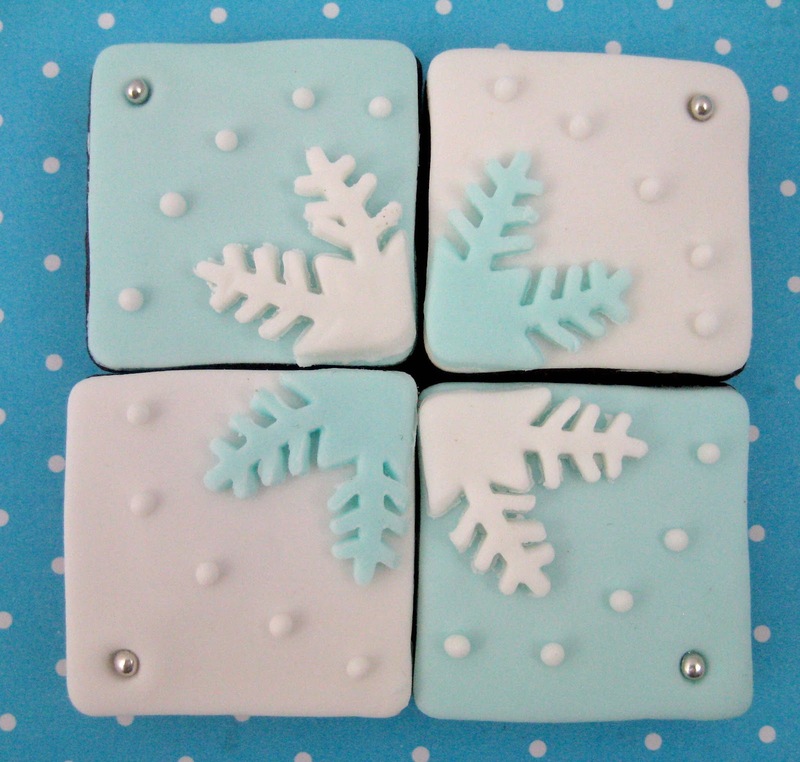 So I decided to try out some incy wincy little square snowflake cookies in a few simple designs and colours. I'm a bit of a fan of bite sized cookies. I would rather have 2 or 3 tiny cookies than a large one any day so these are perfect for me. 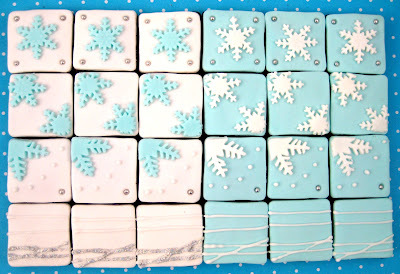 Each set was 12 cookies made using a 3.5cm (1 3/8 inch) square cutter then I covered each cookie with ready rolled fondant rolled out on a benchtop dusted with cornflour (cornstarch) to a couple of mm (1/8inch) thick and adhered to the cookie using a little water and pressing on with the rolling pin. 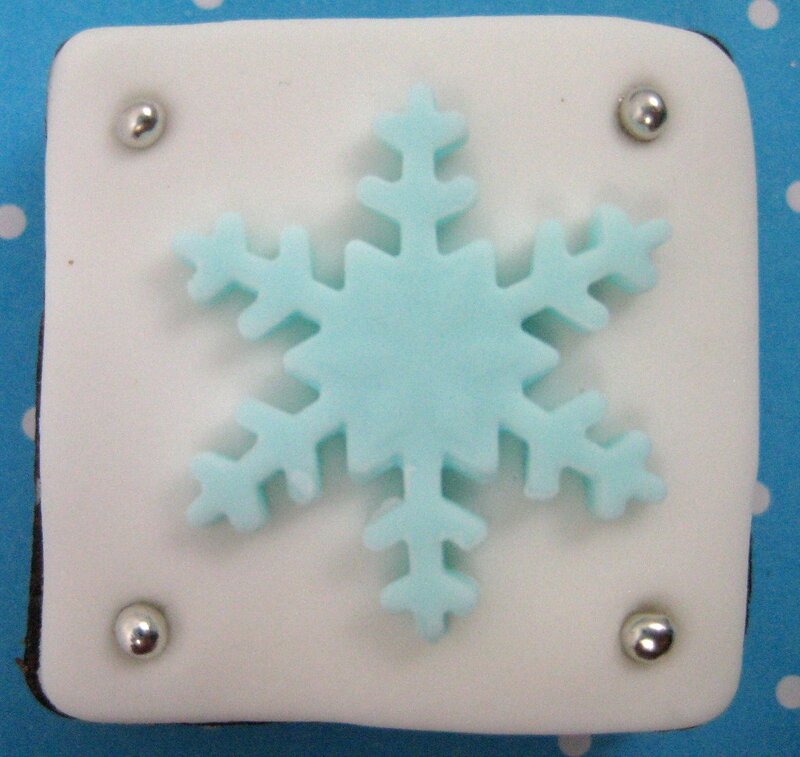 For the single snowflakes I pressed out a snowflake using the smallest cutter from a snowflake plunger set and adhered it to the fondant covered cookie with a teeny amount of water. Using the small end of a ball tool I made an indent into each corner, brushed the indent with a little edible glue and pressed in an edible silver ball. For the cropped double snowflakes I cut out two snowflakes using the smallest cutter from the snowflake plunger set for each cookie arranged them like I wanted them to sit on the cookie and using the same square cutter I used for the cookies I pressed down to remove the excess edges, using a sharp knife I evened up the edges and adhered the snowflakes to the fondant covered cookie. 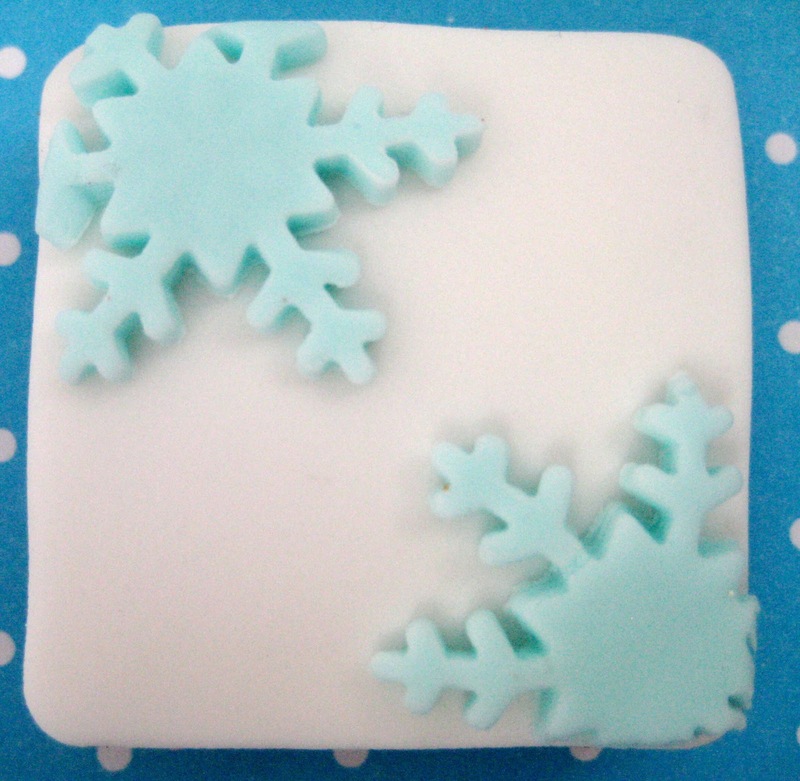 For the large cropped snowflake I used the medium snowflake cutter from the plunger set and using the same technique described above cropped the snowflake. 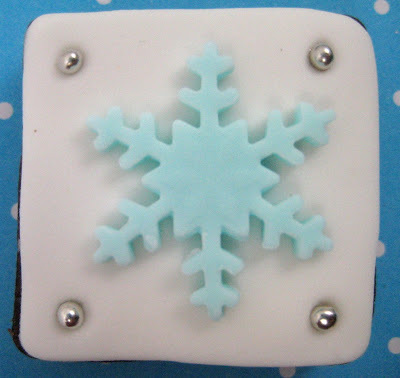 In the opposite corner to the snowflake I used the small end of a ball tool to make an indent, brushed the indent with a little edible glue and pressed in an edible silver ball. I then used a ziplock bag filled with royal icing to pipe 5 dots in a curved around the snowflake. For the random line cookies I piped 2 lines close together at the bottom, a line at an angle crossing the double lines, a single line near the middle of the cookie and another further up near the top. For the white cookie I sprinkled a little non toxic glitter onto the bottom lines to add some interest. I must admit I was a little confused at first! "It's not Christmas yet is it?!" But Christmas in July is such a lovely occassion; and a great excuse too :) These cookies are just gorgeous and I will remember your tutorial when December draws closer. Gorgeous! 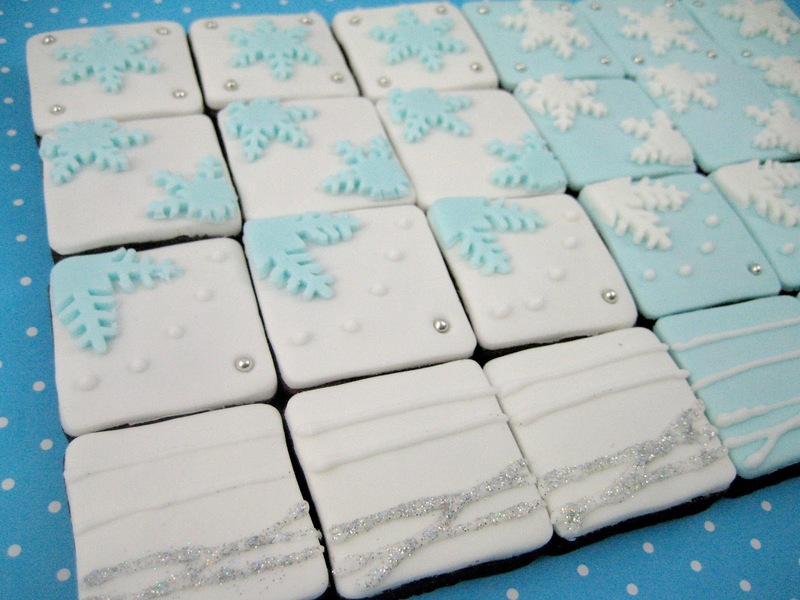 I'm a huge fan on the pale blue, sliver and white theme for Christmas. SUPER CUTE! Christmas is the bomb! I don't care what month it is in! PRESENTS PLEASE! Fantastic! Square cookies have so many possibilities. Yours are just a winter wonderland. Love the color scheme. I love these! it makes me want to throw my own christmas in july party just so I can make a heap like this. 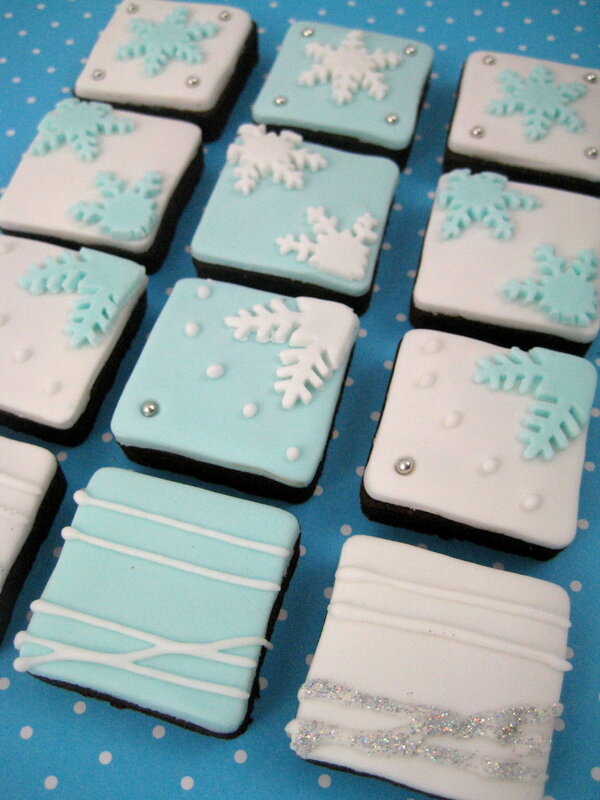 These cookies are so pretty, Linda! I really need to try my hand at fondant~you're an inspiration.